Someone commented yesterday on this blog that they didn’t think that using Dover Coloring Books was real “art”. I agree completely. I also know that in our family they have contributed to a lot of great “art appreciation”. There is the problem. If you are looking for a product that will teach great art skills and techniques, these coloring books are not the solution. I am looking at the coloring books as a tool to learning some very valuable concepts in a more rounded art program. I do feel that the use of coloring books is a great way to introduce small useful skills. I admit that simply handing your child the coloring book and instructing them to complete a page will not help them learn much except to have a little skill with a colored pencil. I never intended or encouraged families to use the coloring books that way in my art program or on this blog. Here are some random thoughts about the use of Dover Coloring Books. I have a child who never colors inside the lines of a coloring book. I am the opposite and at first it drove me crazy that he wouldn’t follow the lines as boundaries for separate colors. Using the lines as a basic guide and not as a strict “do not cross” line, your child can individualize the pages. 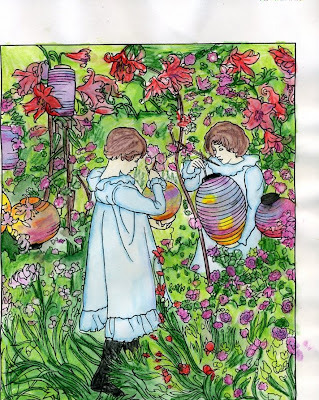 I have seen how observing the black lines of the coloring pages shows them how to set up their own paintings. By comparing the coloring book outlines to the original artist’s painting, they can see how the sketch you start from doesn’t always show all the details. It may not seem like an earth-shattering concept but it is something that every artist needs to know. I know when I first started out trying to “teach” art with my children I felt very inadequate. In those days I thought I had to know exactly what to do so I could “teach” it to my children. Time has helped me see that I do not need to know everything and that starting out with art coloring books is a great way to introduce my children and myself to great artists. It was as stepping stone to picture study. Harmony Fine Arts uses Dover Coloring Books in almost every level for various reasons. The plan uses the coloring pages as a follow up to picture study. Another way they are used is as a connection between history and art. My boys love the Dover Coloring Books that teach about a period in history. They are always eager to pull out their art supplies and get started when it is time to get into the coloring books. They are just another tool to hook their interest and create an anticipation for a topic. It also gives them time to experiment with various art supplies. One benefit of using Dover Coloring Books has become clearer as the years have ticked by. They actually helped my children learn to draw. My middle son loves to draw airplanes but if you have ever tried to draw a real airplane you realize just how hard it is to get the wings to look right and the shape of the airplane to be in proportion. My son solved this problem by looking at Dover Coloring Books. He uses them as a guide when he is trying to make his airplanes “look right”. He is very visual and after looking at the drawing in the coloring book he can see how the author solved the problem and imitate it in his own drawing by first tracing it and then after he became more familiar with the shapes and perspective, he could draw it free hand. Thanks to the black line drawings in the Dover Coloring Books he is now very proficient at drawing airplanes. As I stated at the beginning of this entry, I am a color in the lines girl. My children have really taught me that you don’t have to be confined in between the lines. Staying within the lines is comfortable for some of us but if you can use the coloring books as a tool in the bigger homeschooling picture, they have a solid place in the creative aspects of your day. thin markers, crayons, graphite pencil, oil pastels. Dover Coloring Books are a tool to be used alongside picture study and in addition to a gradual program of learning to draw and paint. You can read more of my thoughts and ideas for using coloring books on my Dover Coloring Books-Art Appreciation Ideas page on Squidoo. We love dover coloring books. I have a lot of them from their history subjects, nature and also a few of the fine art ones. I don’t use them instead of art or drawing. But it is a way for us to really look at something closely. It is so easy to look at the line drawings of flowers and bugs and see each part. 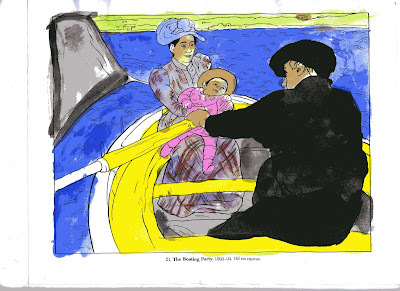 And when trying to color in a line drawing of a famous piece of artwork we look a lot more closely at the colors and strokes the artist used in his. If anything I think the coloring books have made my daughter feel more confident in her own drawing abilities. 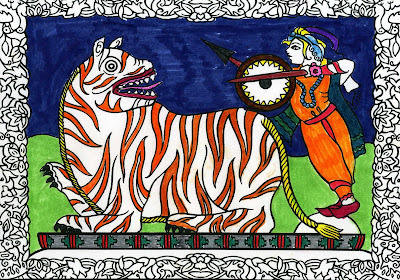 She brings elements she has learned from the coloring pages into her own personal drawings. My daughter is also one of those children that needs to have two things going on at the same time. When I read aloud she colors. It is a way for her to use some of her pent up energy while still listening to audio books or me read aloud. She gets so much more from the read aloud than if I try to get her to sit quietly and just listen. Her mind wanders I think. I love your web site. I am an artist, and an elementary art teacher. I really like your idea of using artist work, Dover books, to teach about artist styles and technique. It is a wonderful way to have the students experience art in a similar way the artist created their work. Thanks Loretta-We love using Dover Coloring Books as a follow up and as a stepping stone.